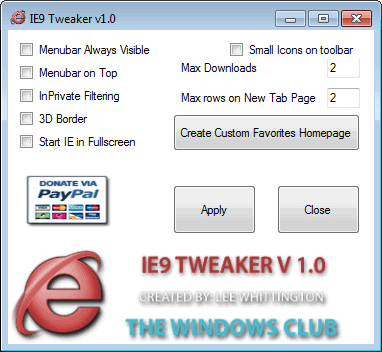 IE9 Tweaker is a new application to tweak a few settings in Microsoft's newest web browser Internet Explorer 9. The program is compatible with the beta of Internet Explorer 9, and it is likely that it will work fine in the final version of the browser as well. Most of the options should be more than self explanatory. Menubar on Top sets the Internet Explorer 9 menubar to be always on top while InPrivate Filtering enables the mode by default on startup. The tweaker can also be used to increase the maximum number of simultaneous downloads, and maximum number of rows on a new tab page. The new tab page displays ten popular sites by default in two rows. Users can increase or decrease that with the setting. Finally, it is possible to create a custom favorites page, which basically is a new startup page for Internet Explorer that displays up to twelve different links to web pages. Internet Explorer 9 Tweaker can be downloaded from the Windows Club website. The program appears to require the Microsoft .net Framework, but no information is given on the version required. Hi Martin. Thanks for featuring another application of mine on your site :) The question regarding the required .Net Framework. Requires .Net Framework 2.0 or above. Thanks for itnrocdiung a little rationality into this debate.